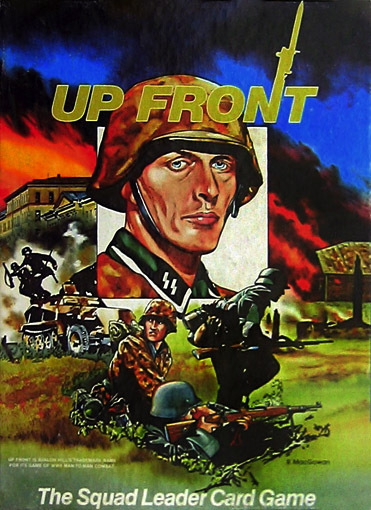 The wargame community is again in high hopes for a new Up Front because the news is out that Wargame Vault has permission to do at least a strict reprint of the original game. So it seems that rights-holder Hasbro (owner of Wizards of the Coast and Avalon Hill) is aware now (after the Valley Games Kickstarter desaster) that the demand for this classic wargame is there and has allowed Wargame Vault to digitally re-master the second edition of Up Front and to offer it through their card printing program. Folks already discuss the news in forum postings and wonder whether this is a hot deal or not so have in mind that in fact what you get here is a pure reprint of the game, so no new rules, no errata worked in and still the original graphics on the cards. It’s a kind of print on demand model and for about 50 bucks you get the game you want to play and that’s fine – given that Up Front in very good condition (or even mint/new etc.) can easily cost you 100 USD or more you might even call this a hot deal indeed. I don’t think it’s impossible to sort this out and they don’t offer the gamebox for exact the reason that they don’t own the rights of that artwork but since they use it on their website to offer the game it doesn’t seem to be good business manners and they use his logo design on the backs of the cards which clearly is violating his rights…so all is not cut and dried yet. It’s a shame that Up Front, this alltime classic and innovative game design is so often in the news lately…but always with a bad taste. It deserves to see the light in a modern new style so new gamers can see for themselves why the old grogs adore this gem of a game so much but it can be doubted that this will happen anytime soon. Up Front 2000… announced for 2013? Just in case you didn’t notice the earthquake that shook the (wargame) world today, here are a few words on that. 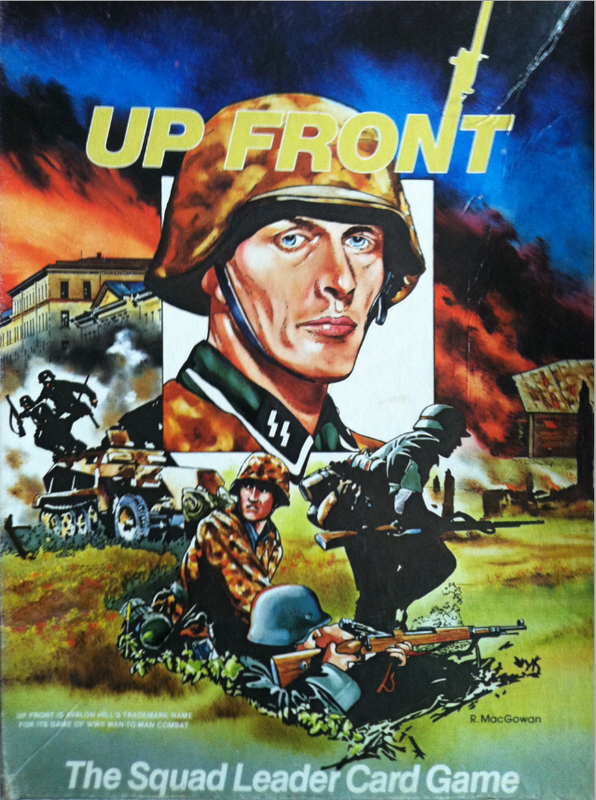 The game was published 1983 and till this day is one of the favorite games of probably the majority of wargamers. Its brilliant design, innovative aspects, simulation value and smooth gameplay was the reason that it won so many friends. The licence was given to MMP by Hasbro (holding the rights to Avalon Hill games) years ago and the well known ASL publisher tried for years to get a reprint done – without success. It was said that although they got the licence to republish it, Hasbro still had the rights and obviously had different ideas what to do with the game – fact is despite a project Up Front 2000, which was the supposed date for publishing the reprint, this name became sort of a placeholder even after the year 2000 and now the time for a possible reprint by MMP is over. So it seems that the licence is given to Valley Games now and this company says they want to do a kick starter project to finance the reprint. It sounds unbelievable but of course we also hope that this is true and that a new Up Front will be for sale in the near future. But it will depend of course what they do with this game, so we wouldn’t advice anybody to sell their copy of the classic game now as some do on the internet (‘sell the game before it will lose its value, you won’t get anything for it when the new version is out’) because even if a new version is coming, we don’t know whether it will be the same game we so love or something completely different with the same name. ‘Improved and enhanced rules’ can mean anything and of course the rules of UF are not perfect (but they are not that ‘bad’ either as some seem to think they are) so improvement is always possible and certainly desirable. What they mean with ‘enhanced’ rules we will have to see…new artwork is great because when we consider how cool for example the LCGs by FFG look then Up Front could really shine on the table if done right. Design…shouldn’t mean to redesign the game as a whole however, because it just works. What we definitely don’t want to see is a watered down version of the game, we don’t want to play an Up Front where there is no Relative Range used anymore – a fantastic concept, but some players seem to have problems to understand how it works. Enhancing could mean to get rid of this core concept to make it ‘easier’, to attract more players. Chits could be larger and more colorful, redesigning the game so it doesn’t ‘need’ any chits anymore would be a mistake. 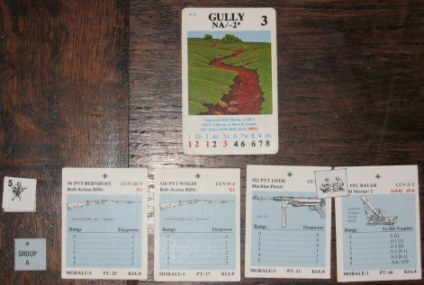 Some cards – representing the soldiers – in Up Front get flipped when their morale breaks and then they have different combat values, so both sides are printed. In CCGs and LCGs these days cards are ‘tapped’ when something happens and we wouldn’t consider this a necessary step in a redesign, flipping is just fine, it works. Perhaps all this is not gonna happen and what they do is just polishing the game, not changing it in essential aspects, but such thoughts come up when you are a fan of this classic. That Cortney Allen, the designer of Up Front, is part of the team doing the reprint design is of course wonderful news and hopefully this will be enough to prevent changes the fans don’t want – and the game doesn’t need. There’s probably no wargame out there that is that perfect than Up Front, it just needs a little polish here and there in the rules, streamlining of some concepts, a state of the art presentation and the base game and the expansions all done in one style to transform it into the Holy Grail of Wargaming. No game came ever that close to this, that’s what we actually think. So lets hope that after so many years we all can indeed sell our old version of this gem of a game in the near future because the reprint is true to the innovative and brilliant design we know and love to play. But Valley Games will have to convince us with their product and so we’ll stick to the old version with all the worn out cards and play classic Up Front until we can actually see what’s up with this new Up Front – if it ever gets published. Up Front – no new version from MMP! Recently, we were able to agree with Wizards of the Coast/Hasbro on extending a number of the licenses that we hold from them. Unfortunately, with the status of Up Front in the air, that license was not continued. WotC/Hasbro could not estimate when, if ever, they would be able to work through the legal issues surrounding ownership of that game that have prevented us from producing anything for the last five years. We regret that we will not be involved in the future of Up Front. We are very grateful to Andy Maly and Ken Smith for all the hard work that they put into Up Front for us. It was a pleasure working with them, although the results did not pan out. We are big fans of Up Front, and we hope it is able to thrive somewhere else. That’s a statement recently posted by Brian Youse over at CSW and really bad news, because as we all know Up Front is one of the best card wargames ever designed and a very innovative and thrilling game. The so called Up Front 2000 project (the plan to publish a new updated and completely overhauled version of the classic game) has been on hold for several years so that nobody really believed it would ever happen, but there’s always this 1% of hope that it will happen anyway – and that hope is now completely dead. Given the situation Brian describes above it seems to be fact now that no reprint/reproduced version will come out and I would suggested that everybody who owns a copy of the classic UF game should by all means keep it and everybody not having it on the shelf should get a copy as soon as it appears on their radar.